PSC Uniform Apparel by COBMEX is the premier manufacturer of sweaters for Public Safety, Corporate/Image Apparel, Postal and School environments. In addition to offering stock product with our label, we also do a tremendous amount of private label programs on both our stock items as well as custom products. Cobmex offers our customers outstanding product, combined with a cost effective value proposition delivered in a timely manner. Our primary market sectors include: airline, transit, security, law enforcement, school, grocery/convenience store, QSR and hospitality. 1. Quality - We stand behind our product 100%. If you have a quality issue with our product, we will "make it right". 2. COBMEX does not sell direct to end-users. You will not find yourself competing against us because we do not sell directly to end-users. Period. 3. Robust in-stock inventory of sweaters. We maintain a comprehensive inventory of stock product in the most important colors for the markets we serve. 4. Low minimum/quick turn for custom product. We offer minimums as low as 150 units for custom product with 12-14 week delivery. Our technical designer can assist in developing specific product if the need arises. 5. 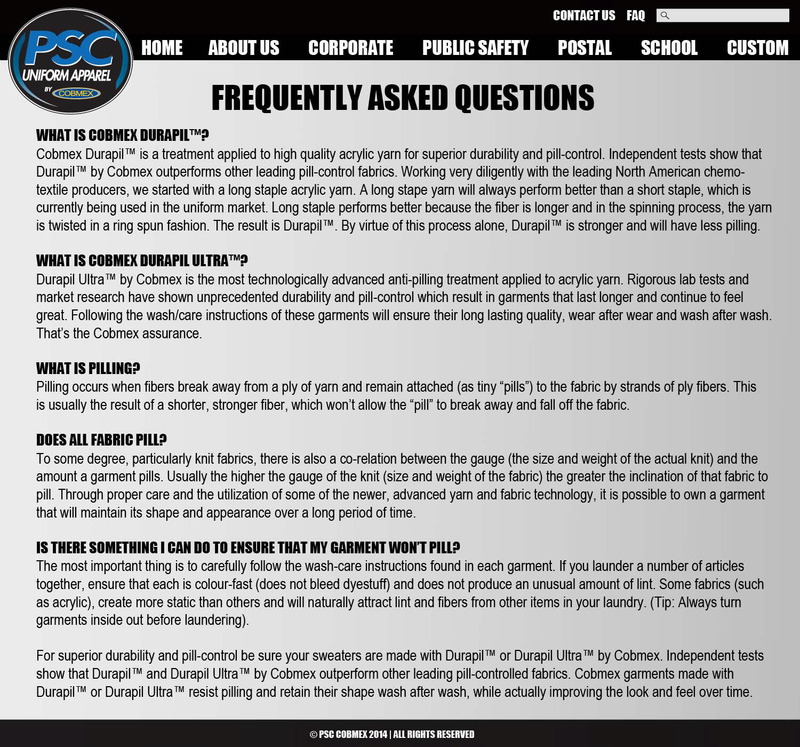 PSC Uniform Apparel by COBMEX sweaters are manufactured with proprietary Durapil™ and Durapil™ ULTRA yarn that are industry exclusive. Rigorous independent laboratory tests have proven that Durapil™ yarns have unprecedented durability and consistently outperform other pill resistant yarns in both pilling and abrasion tests.